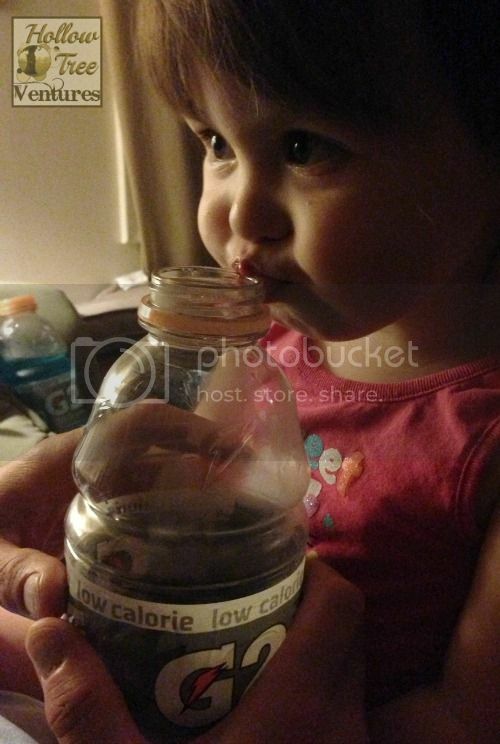 Yes, I said it: our toddler drinks electrolyte-enhancing beverages. Besides, could you say no to this? Anyway, let's not get hung up on that one particular parenting failure when there are so many to choose from. And there are plenty, as evidenced by our Gatorade ritual. This beverage choice is only a small part of the many, many issues we have when it comes to bedtime. And all the other times, too, but I'm too tired to think about those right now (see: messed up bedtime). Please tell me I'm not the only one screwing up this badly. There's never a shortage of tantrums when toddlers are around; the only question is whether it's the kid or Mom freaking out the most. Toddlers, while adorable, can be excruciatingly illogical—especially at bedtime. They ask to hold your hand to climb upstairs, then throw a fit because they wanted to hold Daddy's hand, so you descend and try again with Daddy, but then they scream because you were supposed to wait ON THE THIRD STEP, idiot, so you go back down but that isn't good enough because everything on Earth is ruined, and 45 minutes of crying later you give up and sleep on the living room floor. And that's only if you get that far—the Stage 5 meltdown on the stairs was, not long ago, the 45th step in a nightly series of 4 million flaming hoops we had to jump through to get bedtime underway. The first step was the Gatorade ritual. After announcing it was time to sleep, our 2-year-old would present her standard counteroffer: "Me need fresh Gadodrade." To get her beverage, she would demand to take a seat... on the kitchen counter. 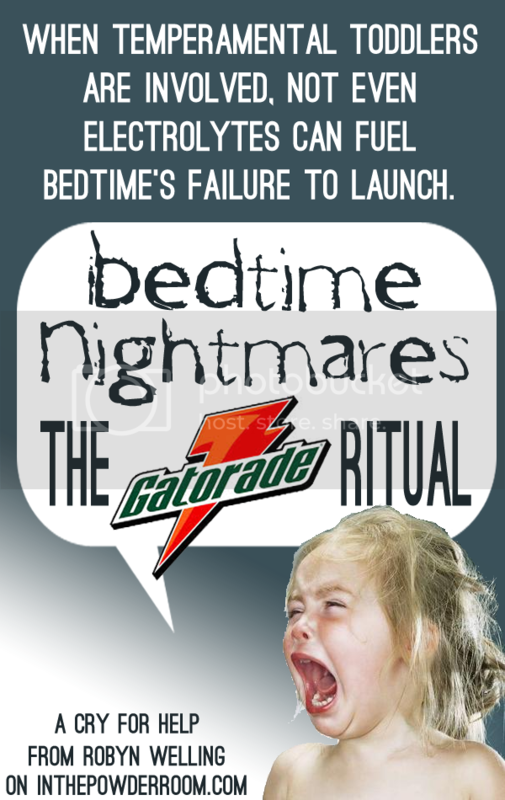 I KNOW that isn't safe, but Gatorade probably isn't either, and if we nitpicked all the poor choices being made at bedtime we'd never make it to step 482, Begging The Child To Please, Dear God, PLEASE Just Go To Sleep And I'll Buy You a Pony Tomorrow, Or Maybe Sell You To Gypsies Depending On My Mood. Then we'd trot out no fewer than three flavors of Gatorade. These had to be mixed in precise quantities, under her watchful supervision, despite the fact that she frequently changed her mind about what those precise quantities should be. Cue tantrum over my inability to separate Gatorade molecules by color and return them to their original containers. There were tantrums over the sippy cup, the amount of water we added, the number of ice cubes—and then, when we were finally finished, she would dissolve into tears again because Daddy was supposed to "fresh my Gadodrade" and no amount of reasoning or sweet talk would convince her to just drink the damn Gatorade, already. We gave in and started over more times than I care to admit. But then, suddenly, she was over it—the Gatorade ritual was a thing of the past. Now, as we soothe her to sleep with movie clips on YouTube... and rubbing our fingers through her hair... and allowing her to use me as a body pillow... I remember the Gatorade ritual. And I remind myself to enjoy this. She'll outgrow this phase too, and all too soon she won't want me to rub my fingers through her hair. She won't want movie clips and snuggling. Yes, I just keep repeating those things to myself, over and over. It helps drown out the Stage 5 meltdown I'm having in my head. This piece originally appeared on In the Powder Room and is reprinted here with permission.